← P is for pattern! Now, I look at collections wondering which ones should I buy the entire collection and the 6×6. Because you never know when you need the shrunken down version of that wonderful pattern. And yes people, you need the smaller version of the pattern- for die cutting or for busy patterns. I find this especially to be true with large chevron patterns. Ohh chevrons, why must you be so trendy when I so do not heart you? 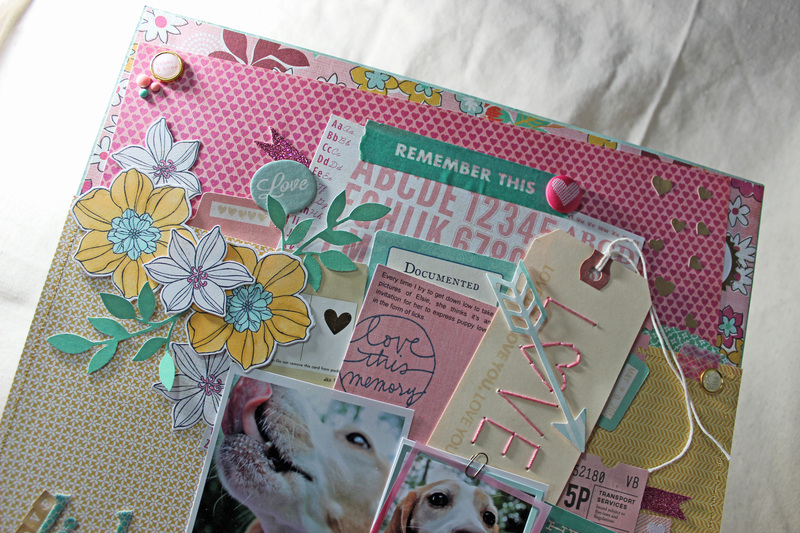 Ok, that is a scrapbook therapy session for another day. This 6×6 addiction does create some issues. Besides being a pain in my wallet (or hubby’s wallet if you ask him), it’s a pain in the posterier because I find myself constantly thinking of new ways to use the 6x6s in my layouts. If you have seen a couple of my layouts, you may notice that I like to use about 4 6×6 papers on a layout, my pictures on top and then begins the tucking and layering with embellisments and a smattering of stamping. Predictability is nice but getting into the creative danger zone is also a good thing. So I forced myself to do something different for this next layout as a form of weening myself off the 6×6 paper pad addiction. Umm, it didn’t take but it was fun creating anyway. Did you spot my poor attempt to sew ? When I decided to have these touches of gold I figured a little gold stiching around my 6×6 papers would be nice. And yes, I cheated. I did not sew them to the background paper. I sewed then I glued. I have sewing machine phobia. Again, therapy session for another day. Did you eye spy copic colored goodness? Well, you should have because I had lots of fun coloring the die cut flowers from a wonderful Stampin Up die cut and stamp set. Title: love licks. Cardstock: Neenah (classic crest solar white). Patterned Paper: Basic Grey-knee highs (ring around the rosies, kissing tag, 6×6 paper pad) –Lucille (shift)-what’sup (6×6 pad), GCD Studies-Chianti collection (large pinwheels), American Crafts-Character (Times). Stamps: Stampin Up (Secret Garden), Technique Tuesday (Love Always Wins, Love This Memory), Papertrey Ink (Tag-Its #11), Hero Arts (envelope pattern), Office Depot (date stamp). Die Cut & Punches: Stampin Up Framelits (Secret Garden), Martha Stewart Crafts (heart confetti punch, double scallop border punch), Jenni Bowlin (file this), Sizzix (little leaves), Lifestyle Crafts (Arrows), Papertrey Ink (rectangular labels). Embellishments: Basic Grey- Fact & Fiction (woven labels)-Hey Girl (die cut shapes)- basics (enamel dots), October Afternoon-Woodland Park (tidbits, journal cards)-Midway (tidbits), Amy Tangerine (fabric brads, embroidered tag), American Crafts-Dear Lizzy- 5th & Frolic (brads, accent & phrase stickers, letter stickers, washi tape), Freckled Fawn (washi tape), American Crafts- glitter ribbon, Thickers (Paperback), Studio Calico- Darling Dear (chipboard stickers)- Snippets (frames)- Sundrfiter (frames), Tim Holtz-Ideology (clips), Misc- (Studio Calico kit- Basic Grey little letter stickers). Copics: BG0000,BG10,BG72,Y21,Y23,Y26,RV34. Inks: Hero Arts shadow ink (soft sand), Momento (tuxedo black), Stampin Up (island indigo). As usual, I have listed above all of the product, tools, markers and ink colors used on my layout. I am also trying out inlinz in order to link my top 5 or so products that really made the layout pop (in my humble opinion). Most of the links are to Two Peas in a Bucket which I heart very much. 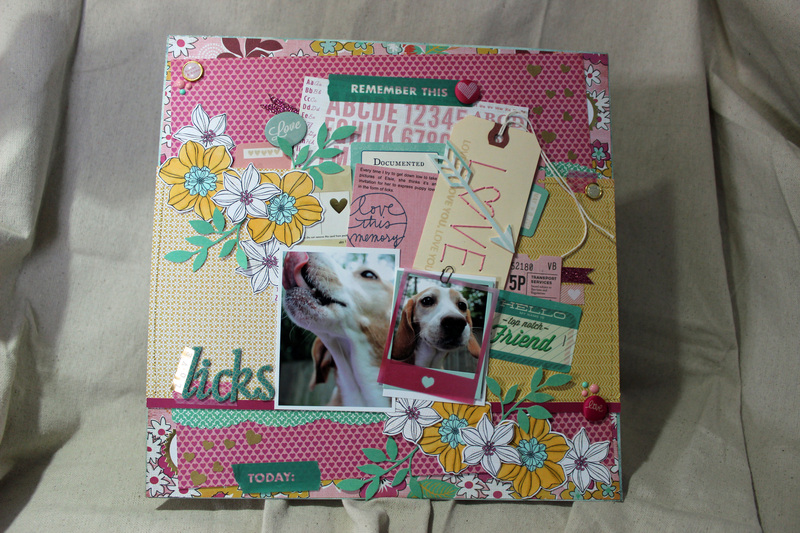 Perfect place for scrapbookers to get new product and check out process videos and techniques. But I would not be who I am if I did not also say this- if you have a LSS (local scrapbook store) please also do your best to patronage there as well. My very much loved LSS closed but thank goodness there is a store about an hour away- Scrapdoodles. I think it’s pretty cute. Love it a lot. 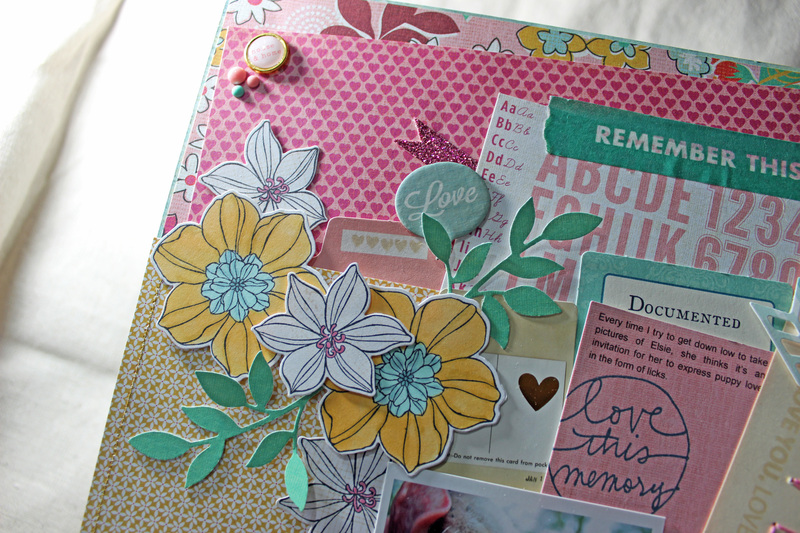 I just love all of the layers here, it is so fun and dimensional! Thanks for playing along with us this week at The Play Date Cafe.